The next generation of villains arrive on Family Channel this summer with the premiere of Descendants, a fantastical music-filled adventure that explores family dynamics with a nod at traditional fairy tales. Premiering Friday, July 31 at 8 p.m. ET/PT, the star-studded television movie event follows Mal, Evie, Carlos and Jay – the teenage offspring of infamous villains Maleficent, the Evil Queen, Cruella de Vil and Jafar – as they face the challenge of living up to parental and peer expectations. Starring Dove Cameron, Cameron Boyce, Booboo Stewart and Sofia Carson alongside Tony Award-winning Kristin Chenoweth, Descendants debuts as part of an exciting evening of programming designed for the entire family, opening with a brand new episode of Liv and Maddie at 7:30 p.m. ET/PT. Filmed in and around Vancouver, British Columbia, Descendants is a classic story of good vs. evil with a modern day twist. The high-fashion fairy tale is set in the idyllic kingdom of Auradon, where goodness has reigned ever since Maleficent, Cruella de Vil, the Evil Queen and Jafar were banished to the Isle of the Lost – along with all the other villains, sidekicks and evil stepmothers – 20 years earlier. Now, Ben, the teenage son of the King and Queen (Beast and Belle from Beauty and the Beast) is poised to take the throne and, as his first official proclamation, he offers the villainous descendants a chance at redemption. Will the seemingly evil teens follow in their nefarious parents’ footsteps and help the villains regain power, or embrace their innate goodness and save the kingdom? debuting July 31 on Family. The fairy tale adventure continues at Family.ca where kids can help Mal, Jay, Evie and Carlos run through the streets of the Isle of the Lost performing cool flips and slides in the brand new game “Isle of the Lost Rush.” The website also features exclusive interviews with the cast, music videos and background information on all of the characters. The movie will be available on Family OnDemand beginning August 7. 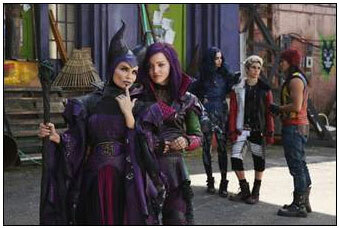 Descendants stars Dove Cameron (Liv and Maddie) as Mal, Maleficent’s daughter; Cameron Boyce (Jessie) as Carlos, Cruella de Vil’s son; Sofia Carson as Evie, daughter of Evil Queen; Booboo Stewart (Twilight franchise) as Jay, son of Jafar; Mitchell Hope as Ben; Tony Award-winning Kristin Chenoweth (Glee) as Maleficent; Wendy Raquel Robinson (The Game) as Cruella Da Vil; Kathy Najimy (Veep) as Evil Queen; and Maz Jobrani (The Interpreter) as Jafar. The movie also features Vancouver-natives Sarah Jeffery (Wayward Pines) as Audrey, daughter of Aurora (Sleeping Beauty) and Jedidiah Goodacre (The 100) as Chad Charming. Emmy Award-winning Kenny Ortega (High School Musical) directs, choreographs and executive-produces Descendants. Wendy Japhet (An Education, The Italian Job) also serves as executive producer and Canadian-born Paul Becker (So You Think You Can Dance Canada) is the co-choreographer. The script was written by Josann McGibbon and Sara Parriott (The Starter Wife, Runaway Bride), who are also co-producers. Mark Hofeling (Teen Beach Movie, High School Musical) serves as production designer and Kara Saun (Project Runway) is the costume designer. This entry was posted on Wednesday, July 8th, 2015 at 10:03 am and is filed under National News. You can follow any responses to this entry through the RSS 2.0 feed. You can leave a response, or trackback from your own site.